The word 'premium' gets bandied about willy-nilly in the TV market, but some sets come along that completely and utterly deserve it. And we're looking at one of them right now. The 3D-ready Samsung UE46D8000 oozes premiumness from every inch of its svelte frame, boasting divine looks, a shedload of cutting-edge features and hopefully picture quality that'll make your eyes pop out of your head. That said, it's not the best-specced set Samsung has to offer. It hails from Samsung's Series 8 range, which is one step down from its high-end Series 9. But in anyone else's line-up it would probably be top dog, which is testament to Samsung's generosity and the breadth of its range. 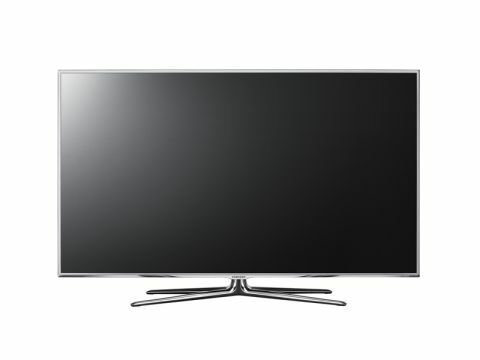 The UE46D8000 takes its place in the Series 8 (8000) range alongside six other TVs, including the 60-inch UE60D8000, 55-inch UE55D8000 and UE40D8000, plus three 'C8000' models from last year – the 55-inch UE55C8000, 46-inch UE46C8000 and 40-inch UE40C8000. All of them are edge-lit LED models. The UE46D8000 really is a fabulous-looking TV. Suave and sophisticated, its astonishingly slim silver bezel makes the screen look more expansive than it is, and it's all perched on a curvy four-pronged silver stand that brings a feeling of hi-tech elegance. This shiny design is sure to add a bit of sparkle to any living room, and as ever the LED panel has facilitated the set's obscenely slim profile (an incredible 29mm). And if that wasn't eye-catching enough, turn it on and the Samsung logo lights up below the screen. The UE46D8000 is also well-stocked for sockets. No less than four HDMI inputs are provided – all v1.4 for full 3D compatibility, plus they're sideways-mounted and easy to access. There are two Scart inputs (both require an adapter cable), plus D-Sub PC, composite, component and two minijack inputs. These are joined by an optical digital audio output, Ethernet port, three USB ports and a CI slot for pay TV.